The cleaning industry is trending toward day cleaning, or cleaning when the facility is occupied. Facility managers want to save energy by reducing the amount of electricity used at night. Buildings are also occupied for more hours of the day, making it necessary for cleaning professionals to accommodate an in-use environment more often. 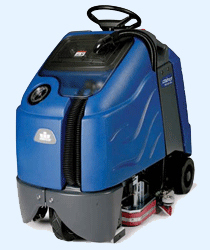 The Chariot iScrub model was designed with day cleaning in mind. The new, simplified drive controls and cleaning function dial improve the performance of the Chariot, making it easier to use, easier to train operators, and yielding more consistent cleaning results. The cleaning settings are programmed at each level so there is no guess work involved with choosing the correct setting.